It was like moving on a movie set, a place so dramatic in its natural form, is hard to imagine. 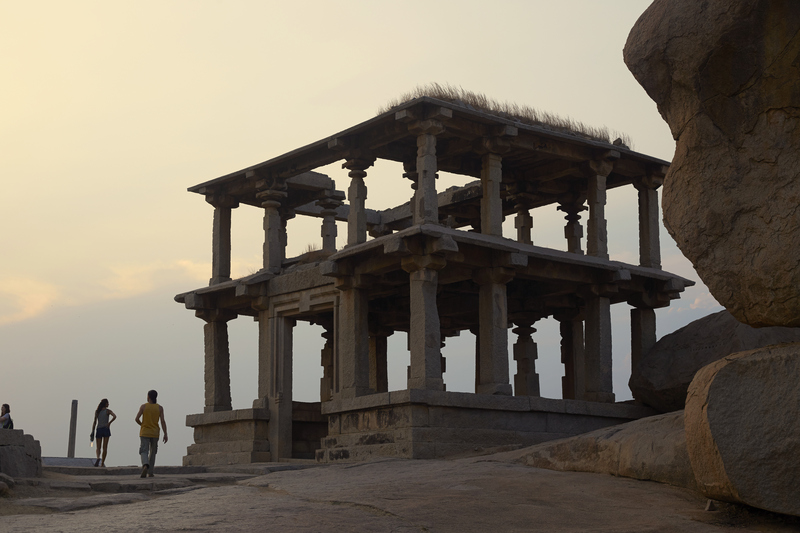 Unreal and bewitching, the ruins of Hampi, lying scattered over a landscape to leave you mesmerized. Giant boulders perching for miles, set under azure blue sky with jade green palm cover serving as the background. Ah! It’s truly out of a set, wrapped in time, nursed by nature. It’s a story of an empire which never died, couldn’t be scrapped from history, an empire that lived upto its name – Vijaynagar. 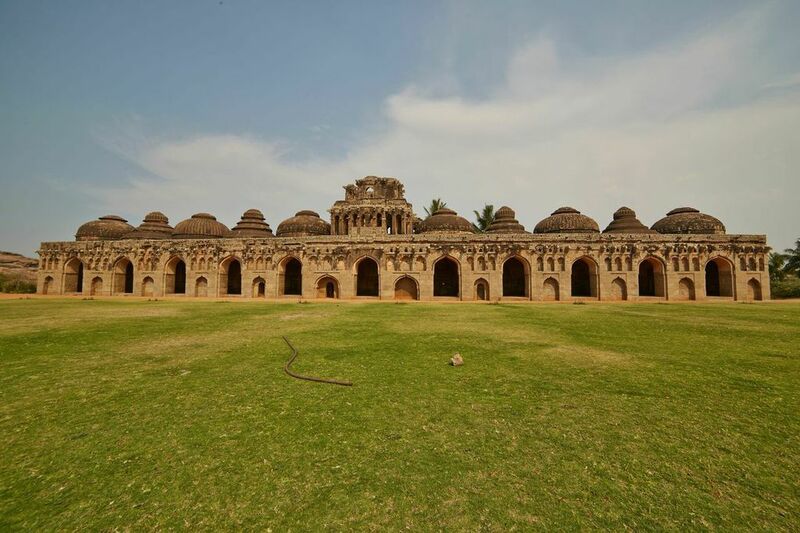 Hampi, a tourist village now was once a thriving capital of the mighty Vijaynagar Kingdom. 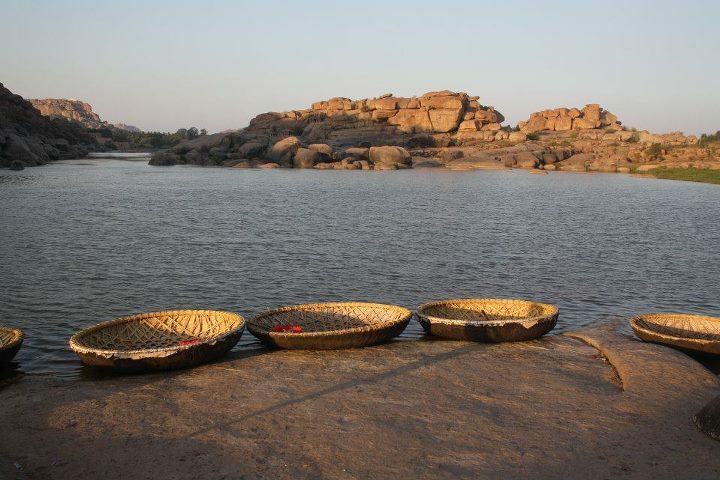 The imperium which lasted for more than two centuries, was founded on this strategic location guarded by the rocky terrain and hillocks on one side and the might Tungabhadra river on the other. The last non-islamic superpower, reaching its acme under the great ruler Krishna Devaraya, had to be literally colluded to dismantle, leaving behind an architectural history that left the Portuguese and the English gaping at. Vijaynagar had always been alluring and enigmatic to me. And thus, my excitement knew no bound, when I got an invitation to visit this UNESCO World Heritage site. In this grand fest of culture and history, I decided to devote a day to side scenes, some explorations and stories and then proceed to the main temple. And when an option of doing the arduous trek of Matunga hill and then a coracle ride on Tungabhadra river was sounded to me, I didn’t think twice to say ‘hit it’. I had the prodigious view of Hampi and the surroundings in mind as I trekked along the rugged terrain, with no proper paths or steps. 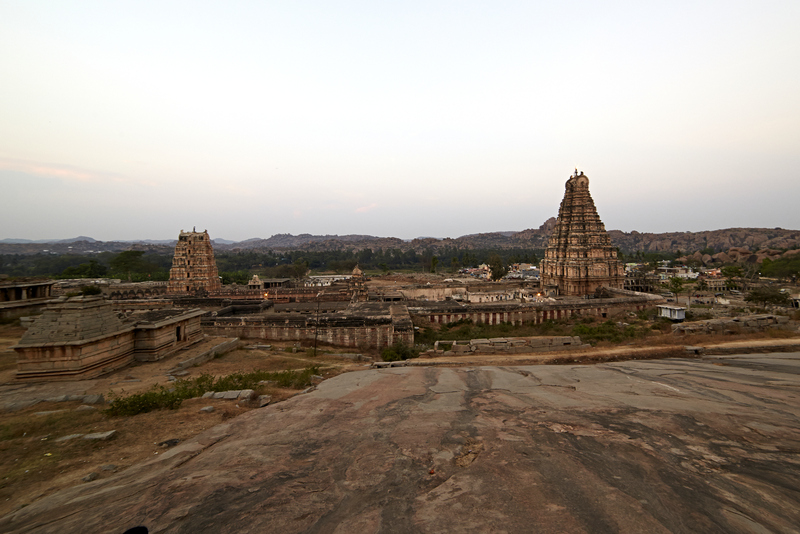 But all efforts are worth considering the untrammeled view of Hampi. Our guide pointed us at an ancient temple Achyutha Raya’s Venkalanatha Temple, nestled in the valley. The standalone ornate pillars and the sculptures on the pillars, now reduced to ruins; edge out as testimony to the artistic dexterity of that bygone era. It is an experience to savour, looking down from that height at the magnificent Virupaksha temple, the Tungabhadra River and life that surrounds this age old relics. It was lunch time and I had a typical ‘kannada’ meal ready for me – Kosambari, playa, chitra anna, bisi bele huli, suggi, siroti with badam milk and mosaru (I had heard these names for the first time). The Kannada food seems to favour sweet toothed guys, marked by a restraint of spices. Amazingly different parts of Karnataka have their different culinary history, the food I had in Hampi was so different from Udipi or Bijapur or south Karnataka. 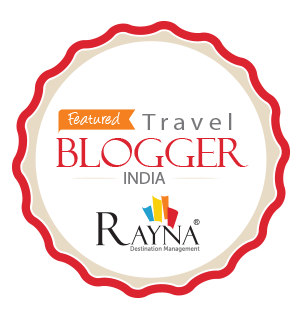 I am sure someday, I am going on a culinary trail in Karnataka. After the trek of Matunga hill, I was off to cover the Hampi market, with the Virupaksha temple standing on one side as a guardian and the Matanga hill on the other. Though reserved for second day, I couldn’t hold myself from visiting the Virupaksha temple as I passed through it. The temple is dedicated to Lord Shiva and has a sprawling complex with many antechambers, halls, flag posts, lamp posts, towers gateways and many shrines. The huge dimensions and the adroit sculptures can astound any tourist. This seems a work of giants, surreal, stark and yet stunning. Tucked in one corner of the temple is Lakshmi, temple’s holy elephant, visitors offer her a coin and get blessed in return. I walked towards the market area, once a sprawling market area, now houses few shops, some located under a tamarin tree, with few rocks and a mud stove and some jars with biscuits for the travelers. But the lady knew the place well, she was certain where Sita dropped her jewels when Ravana abducted her, where Lord Rama met Sugriva (the monkey lord) and all sounded so logically correct as if the epic was being played in front of me. I walked upto the Vitalla temple. 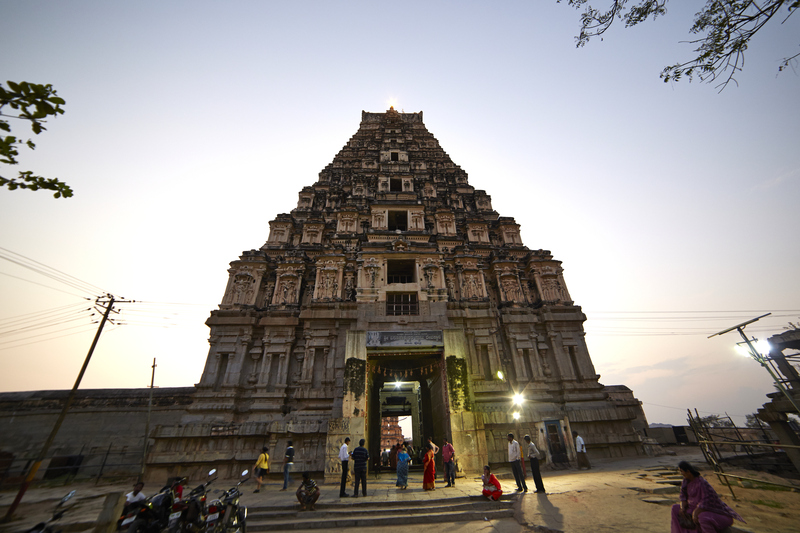 The sacred center of Hampi is housed with numerous, the most significant and of incredible dimensions is the Vittala encompassing over an area of 1 sq. km. Gigantic. Out of sets of Steven Spielberg or Indiana Jones. A landmark feature in the temple is the stone chariot, very much like the one in Konark, but with a moving chariot. The influence of Dravidian style of architecture was evident, gracefully sculptured, a magnanimous 100 pillared mandapa, ornately decorated pillars and huge sabha halls indicating the temple was used for more than religious purposes. Though centuries old, the Vitalla temple still owes the same grandeur and charm; looking like a mayan ruin, with each stone turning a story-teller. An empty bazaar bordered the boulevard that emanated from the temple. Though now mostly deserted, except for the tall trees giving shade to screeching monkeys; in its haydays each class of men had shops contiguous to the other here and riches, jewels, stones were sold openly in these markets. 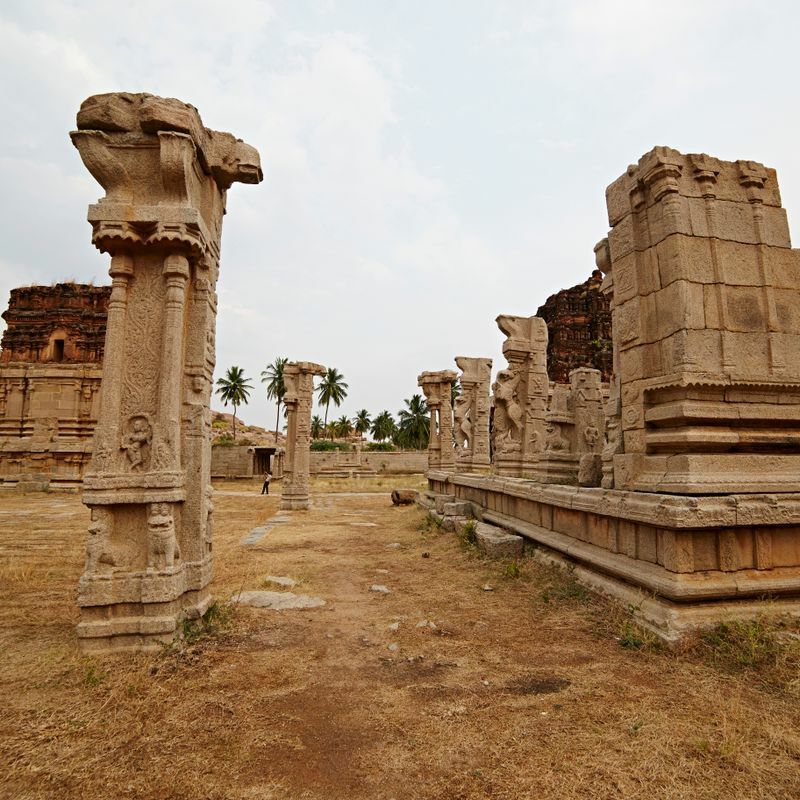 Lying on one end are the ruins of a mint; history suggests that Hampi was the first kingdom to mint gold and use that as currency. That was for my day one. I took the coracle, to cross the river and be back to my hotel. The next day I was to have another date with the history. On one side were the red and ochre coloured boulders, looking as if plucked from Mars, forming natural statues, setting the stage for a grand show of history and mythology. A fine smile crossed my face as I looked back at the huge Virupaksha temple, the bazaar lanes where once diamonds and rubies were sold, the mints and numerous temples. And opposite to this historical wealth, was a landscape dry yet charming, heavy boulders looking like deliquescing ice cubes. Contrast, an inviting one. And then a happy ride on Tungabhadra and a distant sound of evening prayers. The next day as I walked on the same crumbled lanes, looking at the same ruins, things seemed coming to life. I halted at the massive stables where once elephants were kept including the albino ones the kingdom had. As I squinted among the ruins, I felt living Vijanagar’s glory; the emperor’s private bath, the size of an Olympic pool, with a large veranda with protruding balconies all around facing the central pool and dozens of small temples, larger complexes, baths, water storage tanks and statues. I strode off to Mahanavami Platform from where the king used to watch the annual parade of imperial majesty and military might. Today it just gives you a view of this once Indian Rome. Close to it is the lotus temple, probably used by the Military chief as his office or the queens as a pleasure pavilion. Interestingly the temple has Islamic styled arches and roofs. 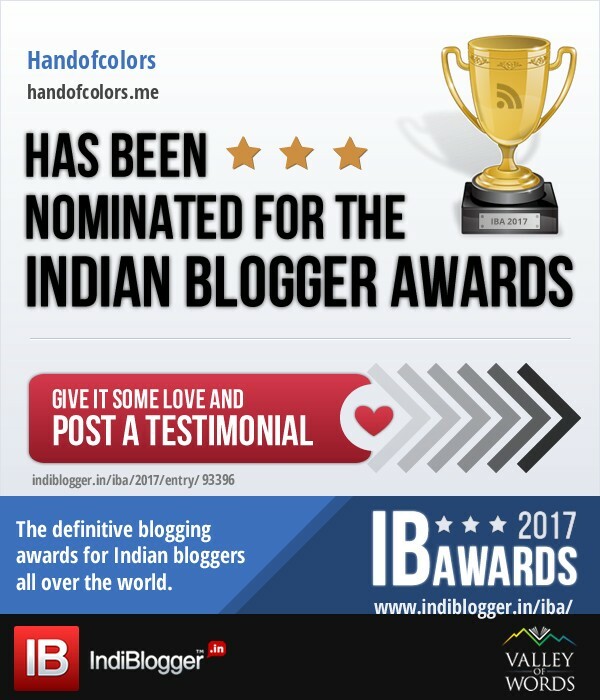 You must have a look at the Hazare Ram temple which used to be the private temple of the royal family, the walls of the temple are beautifully carved and the story of Ramayana (the Hindu epic) is impressively carved on all around the shrine walls, looking like comic strips. As we were nearing sunset, I rushed towards the Hemakunta hill. The journey through Hemakuta auspiciously commences with the darshan of two Ganeshas (the elephant God) Sasavekalu (Sasivekalu means of mustard seed in the local language and the belly of the God is shaped like a mustard) and Kadelakalu (the 4.5 meters tall rock statue). The other side of the hill slopes down to the South of Virupaksha Temple strewn with heavy boulders. The whole view of the Virupaksha temple (the oldest living temple in India) can be had from the hill and obviously, the garden of boulders to match the munificence of the giant man made marvels. Before leaving, I made my way to Kamalapuram, slightly away from the main route, halting at Badavi linga (floating in water), the largest monolith Shiva Linga in Hampi; a close look at the icon reveals its three eyes. Next to it is the much photographed Ugra Narasimha a huge statue sitting cross-legged with broken arms. I had a short tour of two days, but my guide insisted on extending my trip by a day. 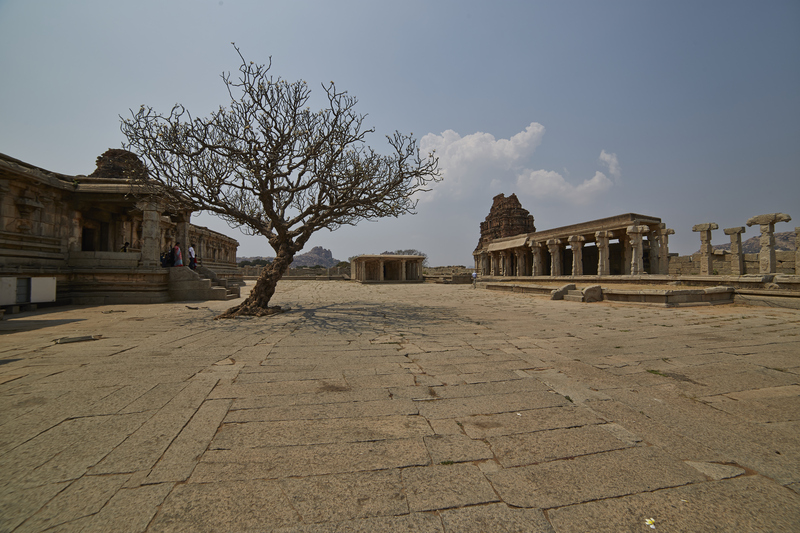 He wasn’t wrong though, in Hampi you start living that glorious past. There are numerous stories, from myth, history and shades of culture. You can’t give audience to all, every person seems to have a different version of a similar tale. The grandeur of this Indian Rome wouldn’t last forever. The city was attacked by Muslim invaders of the Deccan kingdoms, laid waste to the empire, defacing statues, and razing temples. But even with all these carnages, they couldn’t erase the grandeur of this place. Walking on the Hampi lanes, you feel this fighting stopped yesterday.